You may have figured out by now that I love old hymns. 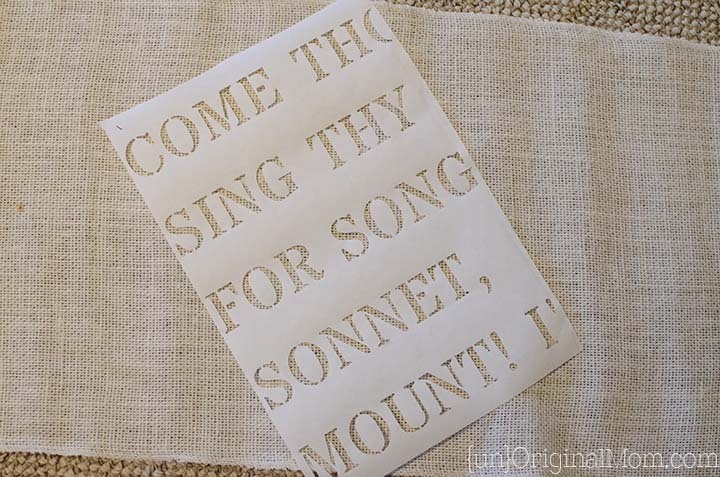 If the canvas hymn art (Be Thou My Vision) didn’t tip you off, maybe it was the spring vinyl art (All Things Bright and Beautiful), or the free Thanksgiving printable (For the Beauty of the Earth). 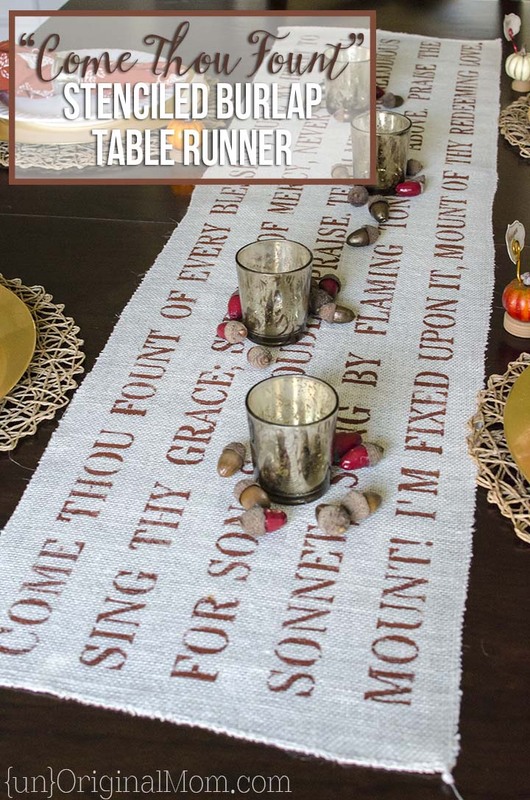 But I’m adding a new project to my hymn collection with this Come Thou Fount Stenciled Burlap Table Runner! So, what is it about classic hymns that I love so much? Well, I’m a music teacher, so the music element is a given. 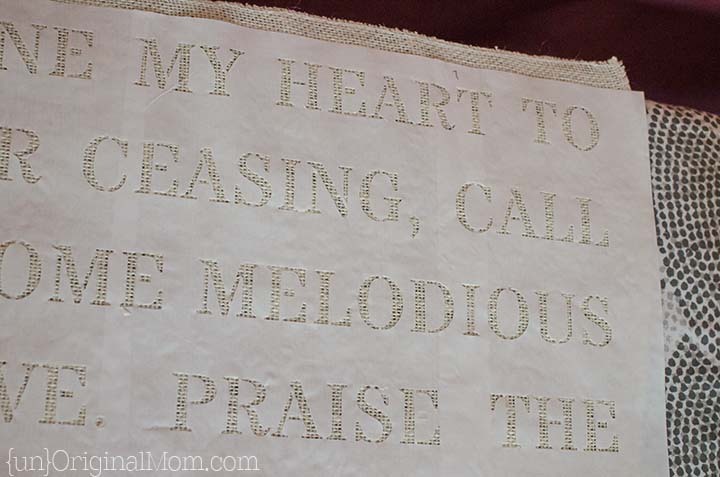 But it’s actually more the text of old hymns that draw me to them rather than the melodies. Don’t get me wrong, I’m not in the anti-contemporary-Christian-music camp (in fact, I’m a worship leader at our church…current worship favorites include this one, this one, and this one) – but they just don’t write lyrics like they used to. There is so much deep, raw, and perfect scriptural truths in those texts. Growing up as a Methodist I learned many hymns from a young age…so those truths are committed to memory with a melody and I can draw them back into my head whenever I need them – and sometimes even when I don’t know I need them. 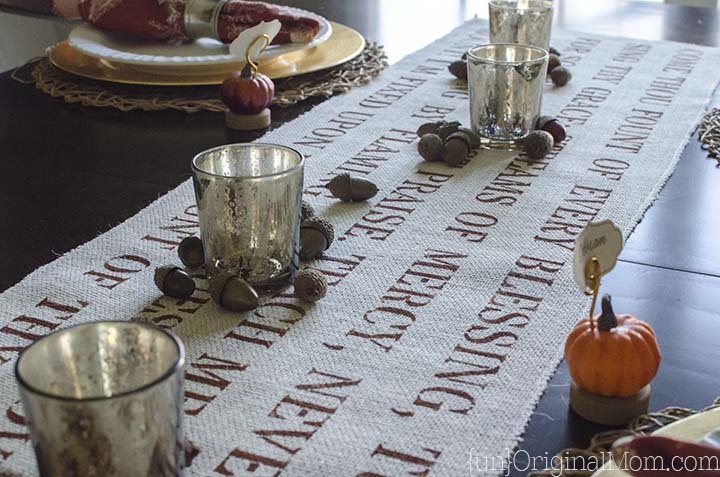 I was originally planning to use just the first line of the text on the table runner, as it seemed an appropriate one for Thanksgiving…but the entire verse is just so rich with truth. As I studied it, a new meaning came to that second line for me: “tune my heart to sing Thy grace.” Tuning an instrument – especially if it is particularly out of tune and hasn’t been played in some time – can be an involved process that involves lots of tightening and loosening or twisting and nudging. Doesn’t sound like much fun for the instrument! But an out-of-tune instrument, even one played by the most talented musician in history, isn’t going to sound very good. We have to allow God to “tune” us each day to his masterful ear. And then, oh to be so full of praise that we long to sing the same song that is sung my the angels in Heaven! What an amazing image, prayer, and song all rolled into one. And now, a brief tutorial so you can make your own! 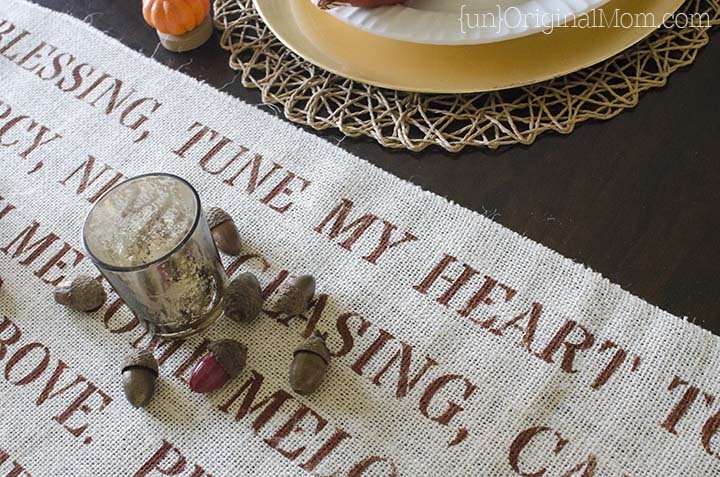 I found this off-white burlap table runner in the Target dollar spot for $3 and knew I had to have it. (That dollar spot is both amazing and dangerous at the same time!) 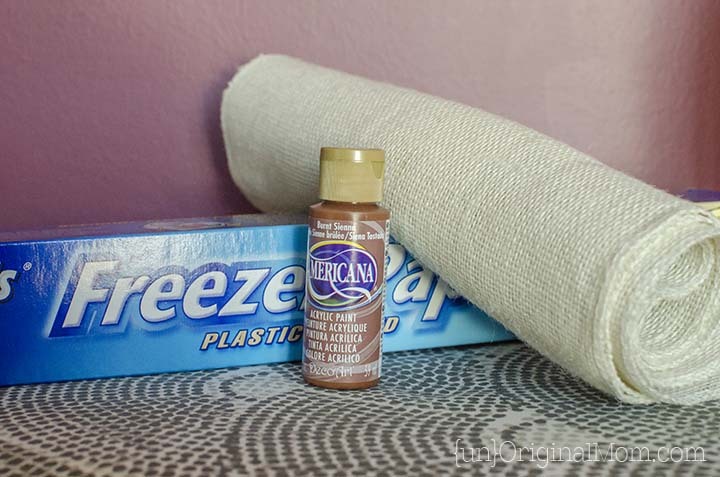 Turns out it was a good decision, as I was able to use a few feet of freezer paper and some acrylic paint from my stash to create this stenciled burlap table runner. In fact, the whole project cost me less than $5! 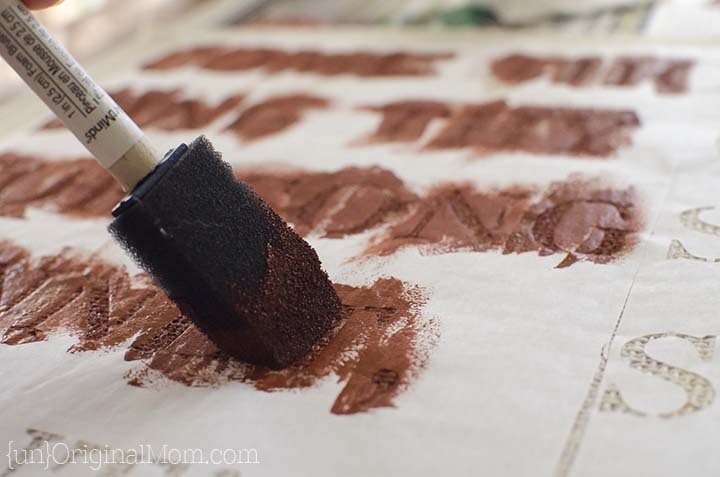 If you have a Silhouette and haven’t yet tried a freezer paper stencil on burlap, you simply haven’t lived. Well, that might be a bit dramatic. But still, it is so easy (and cheap!) – you simply MUST give it a try! 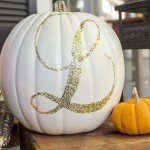 (If you don’t have a Silhouette – but you DO have lots of patience – you could create something very similar to this by just using a regular old letter stencil set from the craft store.) 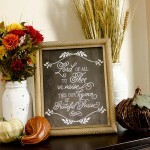 You cut a design out of freezer paper and iron it onto your burlap (or any other fabric material) to paint your design. Once you’re done painting, it lifts up easily with no residue, and you’re left with a nice crisp painted image! The hardest thing about this project was the size of it. 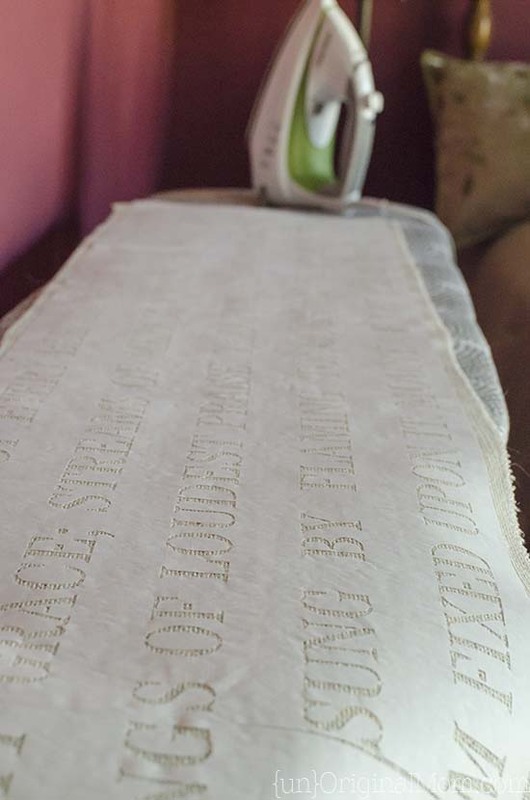 Luckily the width of the table runner was just over 12 inches – the height of my cutting mat. So, once I had completed my design in Silhouette Studio, I lined up the right hand edge of the design with my cutting mat and set the first page to cut. Then I dragged my design over to the left about 6 inches, being sure to overlap a few letters that I’d already cut, and set it to cut again (have a Portrait, so my cutting mat is only 8×12 – if you have a Cameo with a 12×12 mat you could do it in half as many pieces). I ended up repeating this for a total of seven sheets of 8×12″ freezer paper. Lining it up on the table runner was pretty easy with the overlapping letters. The tricky part was getting it all to fit on my ironing board! Once I was finished, I carefully peeled up the freezer paper. 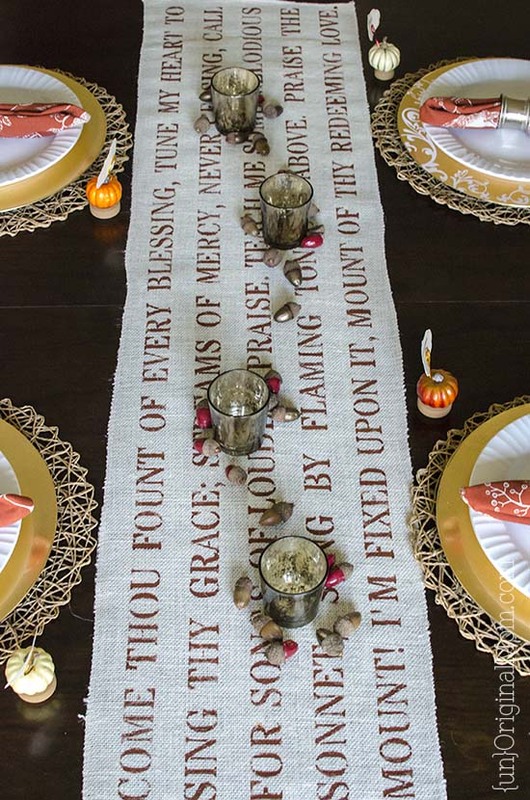 The result was a beautiful, inspiring, and meaningful addition to our dining room table! I didn’t want to bury it under a big huge centerpiece, so I just added a few votives and scattered some of my painted acorns around. 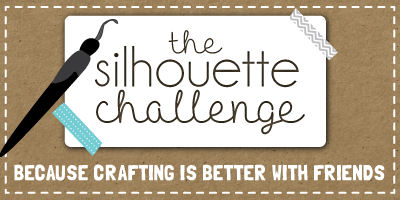 This month’s Silhouette Challenge was a fun one – everyone was tasked with creating a project for less than $5! 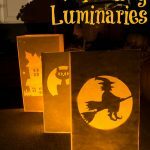 So if you’re looking for Silhouette inspiration that won’t break the bank (but WILL help clear out your craft stash) you’ll definitely want to browse these terrific blog posts! 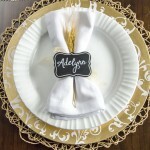 DIY Wooden Place Cards and a Curio GIVEAWAY! I love old hymns, too! This is a beautiful project and one I might have to try myself! Thanks for the inspiration! Absolutely beautiful! And love that lyric! Looks awesome! Great idea Meredith! Thanks so much, Eff! Believe it or not the loads of freezer paper wasn’t really that difficult to work with…the time consuming part was peeling all the letters off my mat after I pulled off the stencil, haha. What a lovely project Meredith, and so meaningful to you too. Loved the tips on overlapping your paper to work within the dimensions that your machine cuts. So useful – Thanks.! So pretty Meredith!! 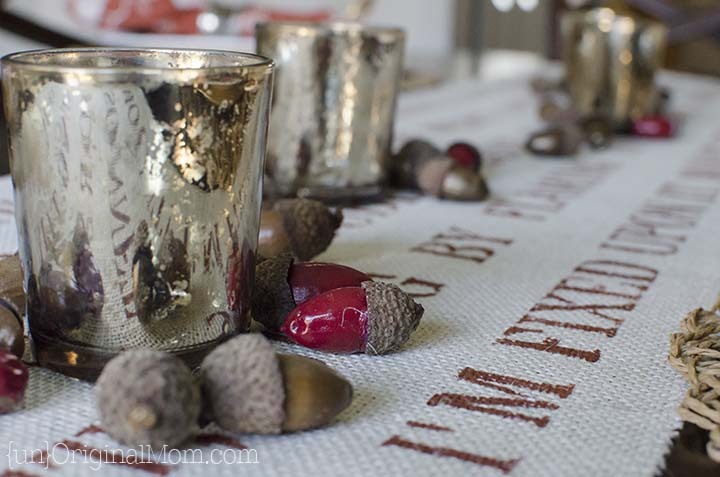 It’s stunning on your table with the votives and acorns! 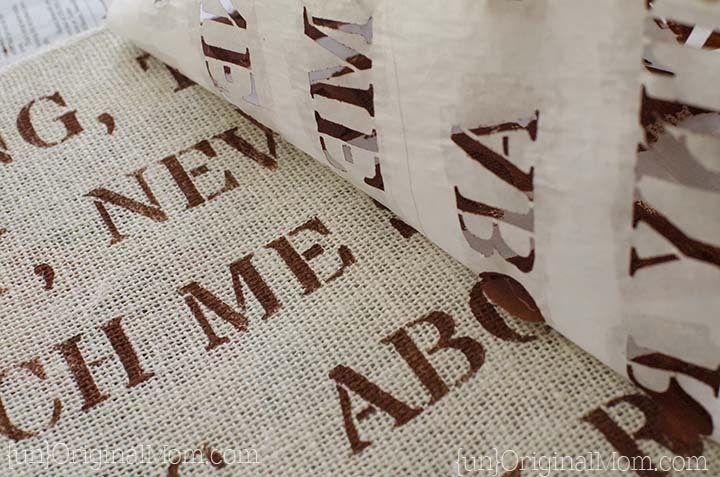 Truly beautiful–both the words you shared in this post and the words you painted onto your burlap runner. I’m continually inspired by you! Those are deep creative wells God has given you. Thanks for sharing! And for coordinating this month’s Challenge. Thanks for the sweet words, Lauren! And I am always inspired by YOU!! I just discovered your site and am really enjoying it. Do you sell copies of the stencil to the hymn Come thy fount ? Thanks so much Janice! No, I’m sorry, I don’t sell stencils. You might be able to find something similar on Etsy, though!